Learn how simple, healthy and creative it is to make your own chocolate (from the superfood RAW CACAO) which is free of sugar, diary, gluten and other suspicious ingredients. Contact Fran to set up your own private/group/corporate workshop. Raw cacao is the precursor to chocolate. In its purest form, its biochemistry is amazing and it is packed with goodness. Raw (or minimally-processed) cacao beans are superfoods. These are foods that contain significantly higher quantities of antioxidants, vitamins, minerals, and other health-boosting, anti-aging, disease-fighting goodies. Some are every day whole foods that you’ll likely have tried before like broccoli, blueberries, and even the humble potato; but others are more exotic, grown in the rainforests of South America, such as the cacao bean. Antioxidant effects:Cacao beans are absolutely packed with phenolic phytochemicals and flavonoids, which protect your cells against damage from free radicals. Oxidative damage can result in premature aging and many of the modern health conditions today. Cacao has 40 times the antioxidants of blueberries! Improves cognitive performance:Epicatechin, the main flavonoid in cacao, improves various aspects of cognition and preserve cognitive abilities during aging. Natural mood elevator and anti-depressant: High levels of serotonin, dopamine, anandamine, tryptophan, tyrosine and phenylethylamine (more commonly referred to as ‘bliss chemicals’) which play an important role in mental health, are present in cacao. This is why the feeling of unity, love, bliss and calm is often experienced when people have proper raw cacao, especially prominent during cacao ceremonies. Potent MAOIs (monoamine oxidase inhibitors), more commonly referred to as powerful antidepressants, are also found in cacao, which potentiates the effect of the above mentioned neurotransmitters (bliss chemicals) so that they last longer in our systems. Lowers blood pressure:Flavanols lower blood pressure and increase blood vessel flexibility. Protects your heart:Flavanols and procyanidins from cacao increase antioxidant capacity in blood plasma and reduced platelet reactivity, resulting in a healthier heart. Regulates insulin levels: Epicatechin, a flavanol in cacao, activates key proteins and help regulate glucose production, even among diabetics. Good source of micronutrients: Cacao beans are also rich in minerals such as magnesium, iron, potassium, calcium, zinc, copper, and manganese. Highest plant-based source of iron: Cacao is the highest plant-based source of iron known to man, at 7.3mg/100g. This compares to beef and lamb at 2.5mg, and spinach at 3.6mg. Note the iron in cacao is non-heme (as is all plant-based iron), so to get the maximum benefits you’ll want to combine it with some vitamin C such as oranges, kiwifruit, or superfoods such as camu camu(which have 40 times more vitamin C than oranges). High source of magnesium for a healthy heart and brain:Magnesium is important for a healthy heart, and helps turn glucose into energy enabling your brain to work with laser-sharp clarity and focus. This is why you might turn to a bar of chocolate during an all-nighter at your desk! More calcium than cow’s milk: Raw cacao has 160mg/100g, versus only 125mg/100ml of milk. While cacao and cocoa start from the same place, the way they end up (and what they go through along the way) has different effects on their nutrition and health benefits. The difference lies in the processing; the more it is processed the further away it gets from being a whole food with all its goodness and benefits as Mother Nature intended. There is a significant difference between commercially available cocoa and raw cacao (and the chocolate made from these two different grades)! This has to do with the vast differences in variety, selection, fermentation, roasting, and processing which affect the amount of the beneficial compounds in cacao. Everything we know as chocolate, in all of its forms, starts at the same source: Theobroma cacao. This tree, native to South America, produces seed pods. Harvesters crack them open and take out the seeds, which are called cacao beans. They look a bit like coffee beans and have a bitter taste. You can eat cacao beans raw – they’re healthiest when eaten this way but their flavor is extremely bitter, and taste varies depending on the growing conditions of the cacao tree. Beans are usually fermented and dried before they’re processed any further. What happens next determines whether the beans become cacao or cocoa. They start from the same place, but the processing makes all the difference. A recent study suggested that between 60% and 90% of the original antioxidants in cacao are lost through common “Dutch processing”. This method was originally developed in the early 19th Century to reduce the bitterness, darken the colour, and create a more mellow flavour to chocolate, but unfortunately also eliminated a lot of the goodness. Non-organic cocoa (and non-organic chocolate) has also been treated heavily with toxic pesticides and fumigation chemicals, and may contain genetically modified (GMO) products. The heavier processing (heating at higher temperatures) that transforms cacao to cocoa doesn’t just affect how manufacturers label the end product. This heat actually affects the beans on a molecular level, changing their structure and degrading nutrient content. In contrast, raw cacao (which has undergone less processing) therefore has a higher nutrient content than commercially available cocoa widely available in stores. It has more powerful antioxidant effects and health benefits. 100 grams of raw cacao powder has an ORAC (oxygen radical absorbance capacity) of 95,500, which represents antioxidant capacity. This drops to 62,100 for cacao nibs, and 26,000 for cocoa powder. It’s not that cocoa is inherently bad for you; it’s just that cacao is more beneficial. Baking with either kind probably decreases some of the nutrients and antioxidants, but unfortunately research quantifying just how much is non-existent at this point. Bottom line: heating cacao or cocoa probably degrades some of the nutrients and lessens potent antioxidant effects. But cacao is the ideal choice because it starts with more of them than cocoa. Cacao can be found in many different forms. A brief description is given below in descending order from whole food to the most processed version of cocoa. Raw Cacao Bean: This is the bean itself that is removed from the pod in the cacao fruit. That’s where cacao’s journey begins, no matter its final form. Once beans are dried and fermented, manufacturers heat them at a low temperature. The heat separates the fatty part of the bean from the rest, a key part of the process. Raw Cacao Nibs: These are just cacao beans that manufacturers chop up into small pieces, still untreated. They’re like chocolate chips, but less sweet, without all the added sugars and artificial sweeteners. There is still all the nutrients and antioxidant power of cacao beans. Raw Cacao Paste: Also called Cacao Liquor, the paste is made by crushing raw cacao beans into a liquid. This liquid quickly solidifies at room temperature and the result is raw cacao paste. Because no heat is used in this process, it retains its natural properties. Cacao paste is naturally about 55% cacao butter and is an extremely smooth product great for use in any chocolate recipe. If you are looking for true dark chocolate, this is it. Not 80% or 90%, but 100% pure organic cacao. No additives, sweeteners or anything else. This product is essential for true cacao chefs who are looking for chocolate creations that are firm and silky at room temperature, or one-of-a-kind homemade healthy chocolate fudge. Raw Cacao Butter: This is the actual fat, a clear liquid, which is naturally extracted when the cacao paste is pressed. It solidifies to a somewhat soft yellow-white butter, rich and fatty in texture (great to use even as a moisturiser). Raw Cacao Powder: By applying a cold-pressing process to the cacao bean, most of the fat (cacao butter) is removed. With the fat removed, cacao powder becomes hydroscopic i.e. it will dissolve in liquids. Therefore, if you are looking for smoothies, hot or cold drinks, raw cacao powder is the most convenient solution. Dutch-processed cocoa powder. This variety, also known as dark cocoa, undergoes additional processing with an alkalised chemical solution to make the end product taste richer and less acidic. Unfortunately, further processing increases degradation of antioxidants and nutrients. Natural cocoa powder. This variety is more acidic and bitter than Dutch-processed powder. It is often in recipes that call for baking soda because the soda alkalises the natural cocoa powder. Cocoa tends to be cheaper than cacao and a bit easier to find. The challenge is finding a high-quality option without any added sugars, dairy products, artificial sweeteners, high fructose corn syrup, or emulsifiers – “fillers” companies use to kick up the flavor and cut production costs. If you’re looking for the best of the cocoa powders, stick to plain versions. Cocoa powder “mixes” often contain added sugar and are loaded with other ingredients. 1) Raw Cacao Butter has an amazing aroma and makes a chocolate that doesn’t melt quite as quickly as chocolate made with coconut oil. It is however quite expensive and the blocks need to be chopped up or shaved to melt, whereas the coconut oil melts easily (in summer it will be a liquid anyway). You can make chocolate with either one, or, a combination of the two. They all form an antioxidant rich, very nutritious and delicious chocolate. 2) Raw Cacao Paste is the best option for a high quality room temperature chocolate. If you want to still make a nutritionally wholesome superfood chocolate but need to keep an eye on budget, then substitute it for raw cacao powder (or if you must cut costs even more try sourcing a good organic cocoa powder). It also gets a little more complicated when using powder as you will have to add cacao butter or coconut oil. The result will be more of a fudge consistency which will need refrigeration to stay firm. 3) Natural Sweetners are much better than the highly refined sugar. If you are okay with fructose, then raw honey is a good choice. Other natural sweetners which have undergone less processing include coconut syrup, maple syrup, agave nectar, rice syrup (try use organic if possible). And then of course there are the natural flavour combinations! 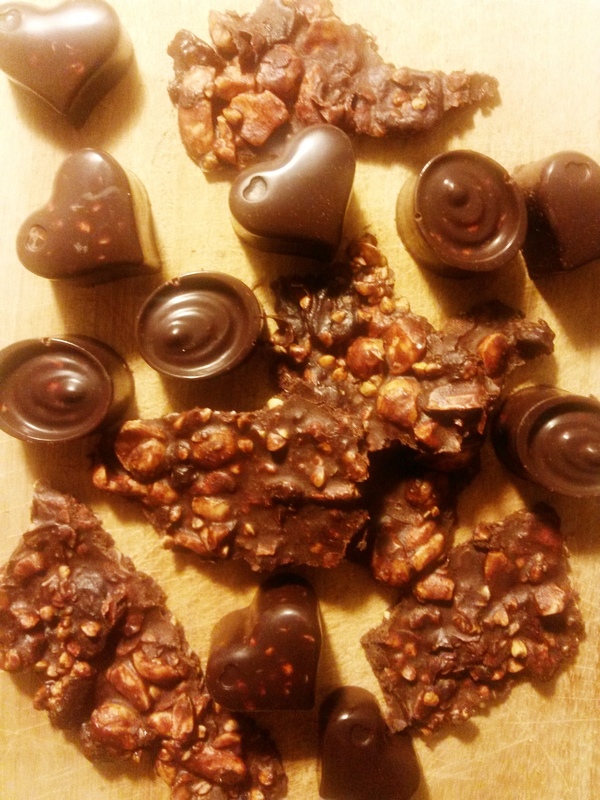 Learn this simple, fun, healthy and rewarding art of raw chocolate making. Contact Fran to set up your own private/group/corporate workshop.